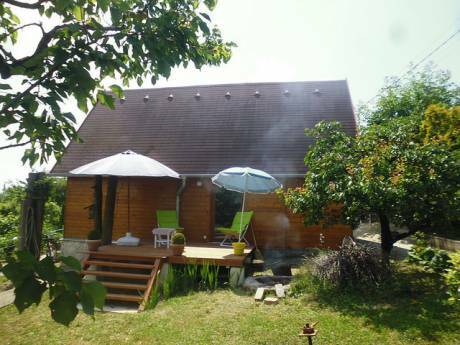 Our cottage is situated In Velence, at lake Velencei, 40 kilometers form Hungary's capital, Budapest. The cottage has two floors. Downstairs there is a living room, kitchen, bathroom, a small study, upstairs there are 2 bedrooms. In one of the bedrooms there are two single beds, in the other there is a double bed and a cot. It is also possible to sleep downstairs on the sofa bed for two people. The cottage is small and cosy, with a huge terrace with a sunshade umbrella and garden furniture. 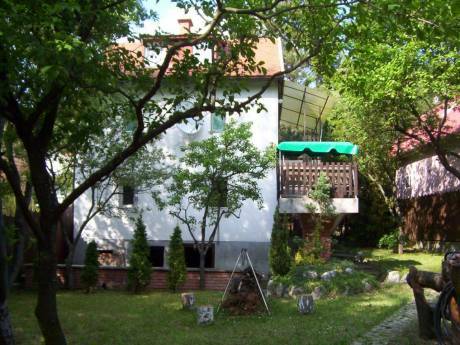 The garden is large, there is a table tennis table, bikes in the cellar and fishing equipment. The kitchen is equipped with a stove and a microwave, in the bathroom there is a washing machine. 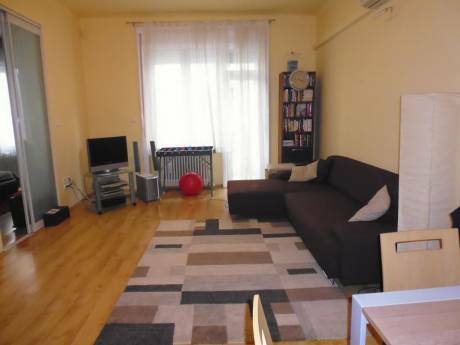 We also have a Budapest apartment available, ID=70328. Our cottage is situated on Bence-hegy, a small hill in Velence. The lake is a ten minutes walk from the house, or a couple of minutes by car. There are several beaches in the neighbourhood. There are four small towns around the lake, each has its own beaches. The lake is very nice, warm, the water is clean. The lake has a rich wildlife, birds, fish, plants. There are nice excursion routes in the hills nearby, and a biking route around the lake. Many people enjoy fishing on the lake, including my husband, so there are fishing rods etc. available for use in our cellar. There are local shops are in the old village, larger stores are a ten minute drive away. There is an ice cream shop in the old village that has the nicest ice cream in Hungary I have tasted. There are some good restaurants, and smaller places to eat at the beach. Don't expect a very busy nightlife here, restaurants and bars close usually at 10 or 11 pm. Children can play mini-golf and go for go-kart rides close by. Székesfehérvár, a historic town is 15 kilometers away, 10 minutes on the motorway. Budapest is 40 kilometers, 25 minutes on the motorway, and you will need another 15-30 minutes to get into the city centre depending on traffic. You can also travel by local buses and trains. Suburban trains take you to Budapest in 50 minutes, trains run frequently, at least once in every hour. Lake Balaton, the other popular summer resort is 40 kilometers away. 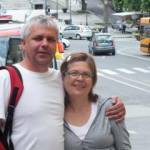 Our place can be a good starting point for visiting many places in Hungary.